This is a simple Electronic Circuit Project of Sun-Tracker circuit. In solar cell array applications and solar instrumentation, it is desirable to monitor the approximate position of the sun to allow efficient automatic alignment. The Ll4Gllens can provide about 15Â° of accuracy in a simple level sensing circuit, and a full hemisphere can be monitored with about 150 phototransistors. The sun provides `` 80 mW/cm2 to the L14Gl when on the centerline. This will keep the output down to,; 0.5 V for f),; 7.5Â°. The sky provides `` 0.5 mW/cm2 to the Ll4G1 and will keep the output greater than 10 V when viewed. White douds viewed from above can lower this voltage to `` 5 Von some devices. 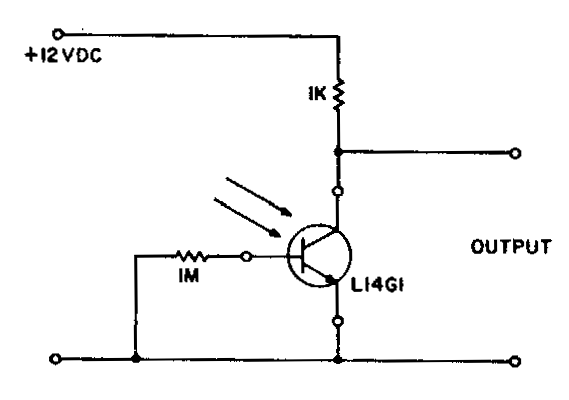 This circuit can directly drive TTL logic by using the 5-V supply and changing the load resistor to 430 0. Different bright objects can also be located with the same type of circuitry simply by adjusting the resistor values to provide the desired sensitivity.